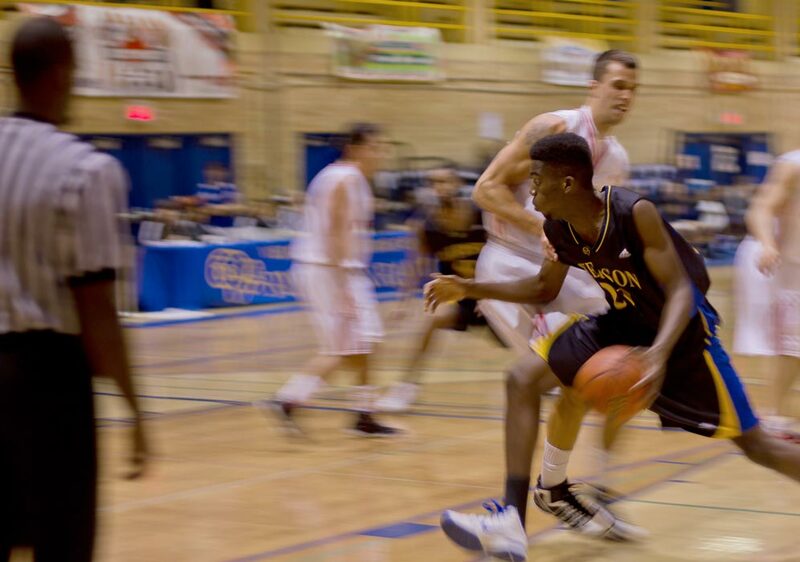 Tensions rose as the Ryerson Rams men’s basketball team dominated their opposition in an 81 – 43 victory over the lowly RMC Paladins at Kerr Hall Gym on Saturday night to extend their current winning streak to four games. In what should’ve been a game where the Rams could cruise to a relaxed victory, things quickly took a turn for the worse. The Rams got off to a quick start in the first quarter and immediately began to pull away from RMC. Frustration got the best of Rams rookie forward Jelane Pryce, as allowed his feelings to be heard after missing an open dunk and RMC Head Coach Scott James did the same as he was constantly upset with the game’s officiating crew. These actions led to an increased physical play, which culminated in several more un-sportsman like actions. Rams Head Coach Roy Rana noticed the increased physical play and simply did not want matters to escalate. The Rams quick start was fuelled by the play of guard Jahmal Jones, who scored 19 of his 27 points and added four of his eight steals in the first half while shooting 80 per cent from the field while Forward Steve Williams added 11 points and 12 rebounds for his first double-double of the season. The Rams never took their foot off the pedal, as they scored 23 points in the second quarter, while holding RMC to a dismal four points. The rigid zone defence implemented by the Rams forced RMC into a drought which lasted nearly seven minutes and allowed the Rams to pull away to a 29 point lead at the end of the half. The Rams increased their lead to 40 points but despite finally finding their game, RMC could only cut the deficit down to 31. “It was one of those games where we weren’t awake so I started to try to help the team,” said Jones. While the Rams’ defence did not allow the Paladins much room to work with, RMC’s offensive play did not help matters. The Paladins had 24 turnovers and allowed the Rams to get 14 offensive rebounds. James spoke bluntly about his team’s play. Now riding a four game win streak, the Rams (6-8) remain tied with the Ottawa Gee-gees in a tight play-off race. The Rams will now welcome rivals Toronto Varsity Blues (9-5) to Kerr Hall Gym on Wednesday night at 8 p.m., in another crucial game. A victory would allow the Rams to begin pressuring the teams which are higher up in the standings and continue their play-off surge. To guard Ola Adegboruwa, the Rams can use the Toronto game to display their true talent.